SAP HANA is a rapidly growing field and is expected to create more lucrative career opportunities in the coming years. Reputed organizations are upgrading to the various advantages and features of this module are offering good jobs that require highly trained professionals and freshers with certification in SAP HANA. A large percentage of these professionals have a strong knowledge base of SAP BW and SAP BI or are qualified M.Techs and B.Techs. With an average salary of 8 lacs p.a, HANA professionals can look forward to an average growth rate in salary of about 28% each year. The average salary of professionals having 0-3years of experience is approximately 3.81 lacs p.a, while those with 3-7 years may expect 6.18 lacs p.a. The top paying companies in this field are SAP Labs, Voltas, Genpact, etc. with Mumbai, Noida, Chennai and New Delhi being the most coveted locations for SAP HANA professionals. Organizations that use SAP functional tools are plugging in SAP HANA due to which, the demand for HANA jobs are increasing each day. However, the numbers of good SAP HANA resources are much less compared to the demand, as a result of which the salary structure of a SAP HANA proficient is 15-40% more than an average IT expert. Thus, the professionals belonging to this domain get an average pay scale of about $51,994 to $145,093. 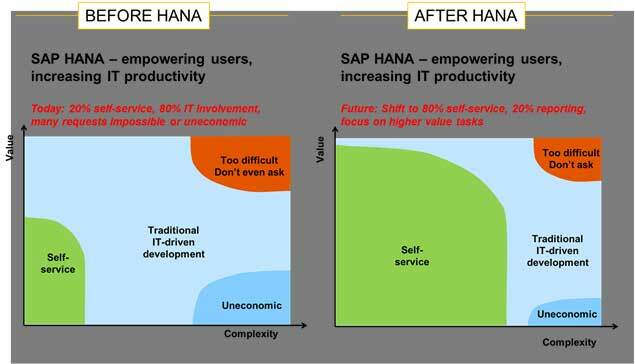 SAP HANA is an upcoming and innovative trend. Pursuing this course with an aim of getting a certification puts candidates on a bright career path. The overview course of this module is highly beneficial for project members, business executives, IT managers, independent application consultants, BW/data warehouse consultants, IT freshers with basic awareness about SAP ERP system and many others .It can be covered in 2-5 days. SAP HANA also serves to be feasible domain for professional and budding data modelers who essentially handle huge databases that support real time applications. SAP HANA in-memory Business Consultant: He/she should understand how in-memory technology technologies can cause interruption in the businesses and knows how to apply the technology concepts to business scenarios. SAP HANA Performance Consultant: He/she is responsible to take the models developed by the Business Consultants and then creates architectures, solutions and designs using SAP HANA Modeller tool. SAP HANA Operations Consultant: He/she should understand technical architecture, Linux, in what way SAP HANA should be installed or migrate systems, along with a basic understanding of SAP Basis. SAP HANA BW Consultant: The individual should have specific skills about architecting, re-architecting and modeling BW solutions in SAP HANA. SAP HANA Application Developer: He/she should understand the existing development platform, and in-memory computing concepts to build ABAP applications using the HANA database, or mobile applications using the HANA XS Application Services layer. SAP HANA Security Consultant: This is a niche area which includes security design, access control and security models. The individual should have skills in SAP ABAP, Java, Sap HANA, enterprise portal etc. SAP HANA Project Manager: He/she should have prior experience with SAP HANA implementation or enhancement projects along with at least 6 years of project management practical experience. Uncover the value of SAP HANA - join today!